Kansas City Confidential is a sweaty Film Noir. The sweating starts when bad boy Pete Harris is recruited as part of a heist team. Jack Elam's (Harris) long and rubber face beads up with tension. 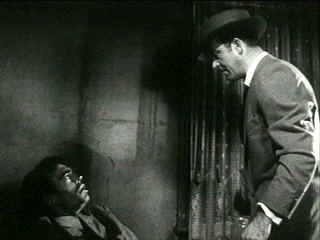 When Joe Rolfe steps into Harris's shoes, the desperate framed hero played by John Payne sweats in every frame. Director Phil Karlson's close-ups emphasize the beads of perspiration sliding down Rolf's face like amorphous acne. What makes the sweat even more remarkable is the cool of others in the same frame. It's like these characters are suffering from a leaky nervous system. The central conceit is pretty good. None of the robbers know the identity of the others except for "Mister Big," the guy who sets everything up. The essential planning is depicted by Karlson at the outset in strong visual strokes. The recruitment of the bad guys is short, efficient, taking up little time in getting to the heart of the matter. The movie is all about the split of the heist proceeds and how that plays out. It's not as fast-paced or clever as one might hope, but it holds your attention as it moves toward the pay-off. John Payne is an effective Noir protagonist. Payne often looks forlorn. Nothing is going his way. He's not an especially good actor, but the bad luck quality that blends into the fiber of his clothes translates well for the part of ex-con Joe Rolfe. Preston Foster knows his way around tough guys. The movie veteran gives Mister Big a hefty dose of confidence. Lee Van Cleff and Neville Brand join Jack Elam forming the trio of recruits for the heist. All the players are tough, though Karlson is somewhat inconsistent in depicting the players from scene to scene. Colleen Gray plays the good girl out to save the hero with a extra helping of smile. Production values are clearly limited. The "B" budget lingers at the frayed edges of the settings, but it works in favor of the no-nonsense style of director Karlson. Kansas City Confidential is a lean entertaining example of Film Noir. This is a pretty dirty-looking DVD. During the first reel there's a full length scratch with ringing continuously. Various dirt and scratches mar the image from start to finish. Scene to scene clarity is inconsistent. Lighting and gray scale are pretty good. The Karlson ambiance is replicated fairly well. Film grain is a bit inconsistent and slightly heavy at times. There's some hiss in the mono soundtrack. Overall, the DVD is merely serviceable. As a bonus, a nice little interview with supporting star Colleen Gray is conducted by Film Noir author Eddie Muller. There's also a trailer for Karlson's 5 Against the House, in pretty poor shape, but it looks like a good flick.